Spyware blockers attempt to block installation of spyware in the first place before it becomes a problem on your computer. Yahoo Toolbar with Anti-Spy is one of those browser toolbars that adds new functionnalities to your browser, such as easy search and a bookmark services, but this version also provide anti pop-up features and some form of protection against spyware. 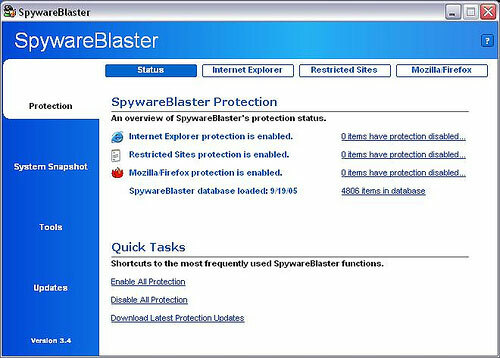 SpywareBlaster prevents the installation of ActiveX-based spyware, adware, browser hijackers, dialers, and other potentially unwanted software and can also restrict of bad behaving sites. It offers a up-to-date protection with the latest definitions files. It also allows you to revert back to a secure state of your computer if it ends up being infected with spywares or browser hijackers.